The Libya Football Federation has appointed Egyptian Hany Ramzy as coach of the national team. The former Egypt defender, 48, takes over from Jalal Damja, whose contract as manager of the Mediterranean Knights expired in November. His main task will be to lead Libya to the 2019 Africa Cup of Nations in Cameroon. Ramzy's first competitive game will be in September away to 1996 champions South Africa. Libya began their 2019 campaign with a comfortable 5-1 win over visiting Seychelles but face a tough task of qualifying for Cameroon with Nigeria the other team in Group E.
Sacked by Ittihad of Alexandria in October, Ramzy has previously managed Egyptian sides Enppi and Wadi Degla. He has also had spells as coach of Egypt under-20s and as caretaker coach of the senior side. 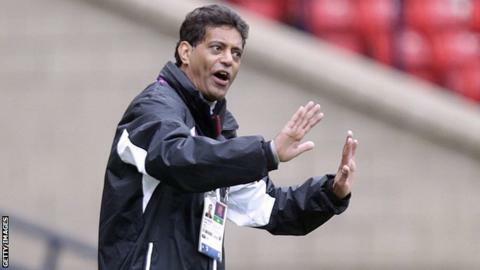 As coach of the Egypt's under-23 team he led the side to 2012 London Olympics after claiming third at the inaugural African championship in Morocco. Ramzy, who spent more than 15 years playing for clubs in Switzerland and Germany, also had a brief spell as coach of UAE side Dubai CSC and Lierse in Belgium. He took over at the Belgian outfit in November 2012 and stayed only six months. As a player he featured for FC Saarbrucken in the German second division but spent most of his career at Bundesliga clubs Werder Bremen and Kaiserslautern. He also played at Neuchatel Xamax in Switzerland but his time at the club was plagued by injury forcing him to retire in 2005. Ramzy was capped 124 times for Egypt and played in their 1998 African Nations Cup winning side and at the 1990 World Cup finals in Italy.